I’m always scouring the web and wracking my brain to come up with the best recipe for you guys, and this time, I think I have just nailed it. It’s so perfect and fresh for summer. I can actually picture myself eating it at a morning brunch, book club gathering, or along-side a large glass of iced tea… Except for the fact that I don’t usually host brunches, I’ve never been in a book club, and I don’t drink iced tea. Regardless, it’s a perfect cake that you are going to want to share with your friends and family. The thing is, this isn’t just any old banana cake. This is a banana cake punched with summer! The flavors of summer are really what I love the most about these months. Berries. Citrus. Freshness. It all piques my tastebuds. And this cake is amped up with a citrus-y orange flavor that you won’t be able to miss. I was nervous that the orange flavor would be lost in the baking time, but oh no… it’s still there, and it’s big! I used a technique with my orange zest that I used in my Glazed Lemon Blueberry Cake, and it just makes the flavor POP! You measure your granulated sugar into a bowl, and then zest the orange right into it. Combine the zest into the sugar and kind of work it all together with a fork, and your sugar will be all infused in the greatest of ways. This way, you are sure to have your orange flavors moving all through the cake. Do not skip this part of the process. You don’t have to thank me… although you might want to! 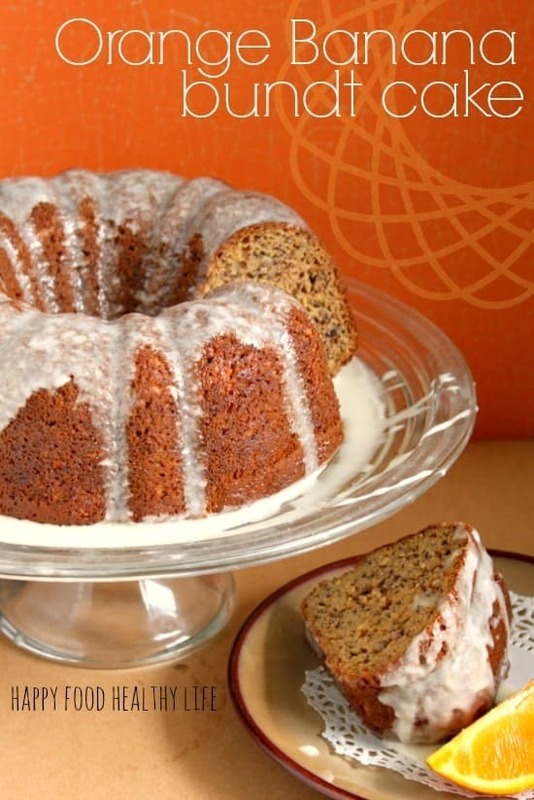 Please enjoy this simple bundt cake this summer. Grab 10 friends, 10 forks, 10 plates, and a pitcher of your favorite fruit-infused water. This cake pairs well with laughter and sunshine! Center a rack in the oven and preheat to 350 degrees F. Generously butter a 9- to 10-inch (12 cup) Bundt pan. Whisk the flour, baking soda and salt together. In a stand mixer fitted with a paddle attachment, or with a hand mixer in a large bowl, beat the applesauce & sugar at medium speed until mixed well. Beat in the vanilla, then add the eggs one at a time, beating for about 1 minute after each egg goes in. Reduce the mixer speed to low and mix in the bananas. Finally, mix in half the dry ingredients, all the sour cream and then the rest of the flour mixture. Scrape the batter into the pan, tapping the pan on the counter to release any bubbles in the batter. Bake for 65 to 75 minutes, or until a thin knife inserted deep into the center of the cake comes out clean. Check the cake after about 30 minutes - if it is browning too quickly, cover it loosely with a foil tent. Transfer the cake to a rack and cool for 10 minutes before unmolding onto the rack to cool to room temperature. If you've got the time, wrap the cooled cake in plastic and allow it to sit on the counter overnight before serving - it's better the next day. To make glaze, whisk together the powdered sugar and freshly squeezed orange juice. Pour over completely cooled cake and allow it to fall down the sides. I love that you were able to make a cake without oil. I often bypass a recipe when I see how much oil it requires. My husband would devour this in no time! Paula, a good rule of thumb for oil in baked goods: substitute with unsweetened applesauce!! Does the trick and makes it taste so much better and turn out even more moist! Oh YUM!! 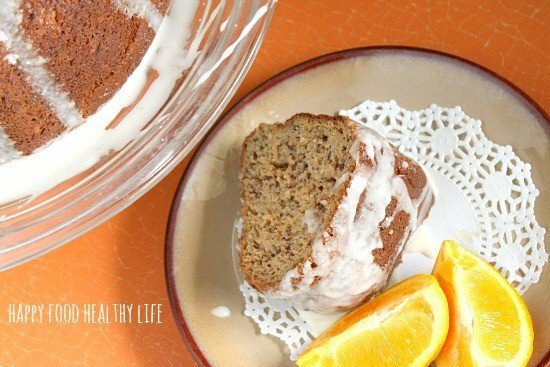 I’ve made an orange bundt but never with banana. I never thought to make the orange sugar. I do it with vanilla bean, so it should be a “duh” type of thing. Genius! I learned the citrus-sugar trick from Joy the Baker and it makes SUCH a difference in kicking the flavor up a notch! I have never tried to make a bunt cake but this has lots of good fruit in it. Lisa, this was actually my first ever bundt cake, and it was SUCH a success! I hope you try it out! Love just about anything orangy. Thanks!! you and me both!! Well, except I don’t like Orange soda… it’s gross to me. too artificial. But this cake… all natural yumminess! I wasn’t sure about it either, but holy YUM! an experiment gone RIGHT! One word, YUM! I will be pinning this right now! Oh what a delicious sounding an beautiful cake! 🙂 Thank you so much for sharing with us at Tasty Tuesdays; just wanted to let you know that this recipe is being featured on Twitter on Friday. Also, I am now following you via Twitter, Pinterest, Instagram, Bloglovin, G+ & Facebook. Yep, you definitely nailed it! I would show this recipe to my grandma, she will love it! Thanks for linking up to Less Laundry, More Linking 🙂 Hope to see you again next week. I hope you do share it Mariely! This cake looks delicious! I have some brown bananas that would be perfect! Amber, I hope you are able to try it out with those bananas!! I’m always trying to think up different ways to use the brown bananas. It’s delicious. I wish i can make it. 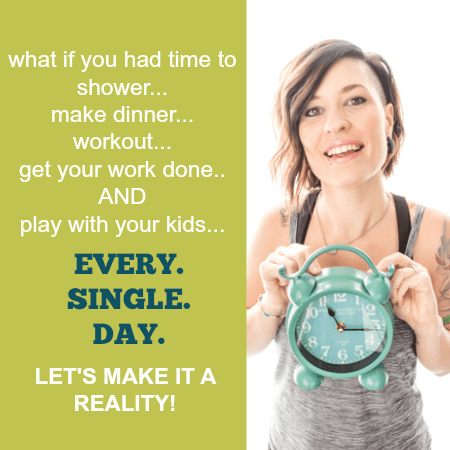 it’s so simple, and you’d love it! Thank you! Doesn’t it just look like it would go perfectly with a cold lemonade while sitting out on the porch?? Your bundt cake just screams “SUMMER”! What a beautiful cake. It is definitely going on my “must bake” list. I would love if you would share this at my new link party, Celebrate It! Hope you stop by! Thanks! Thanks Teri! You’ve got to try it – you will love it! I love the sound of this recipe. But would it be possible to make it in a flat pan? I’m sure it would be. You just may need to adjust the cooking time and keep an eye on it.